Got my package from itsaring! 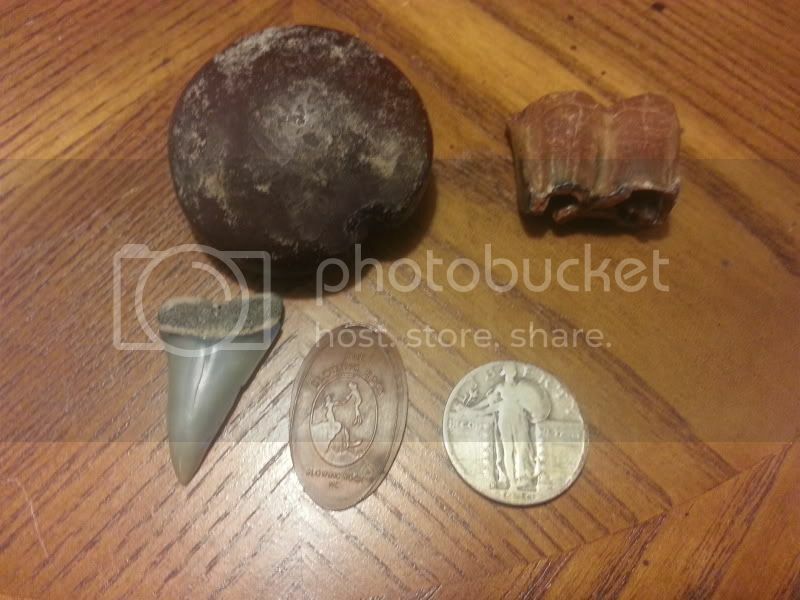 A cool seabean gonna have fun identifying it also a camel and shark tooth fossil a standing liberty quarter and a smashed penny gonna make the shark tooth into a necklace pebdant! Here is the pic of the gifts from Silverfishin. Got an awesome K-BAR Knife which I really need as my last one broke. And, a nice cap from Rothco. I go thru these caps like crazy so it will certainly come in handy. Thanks, Silverfishin! Me and my buddy Keith exchanged gifts! It took me a while to put pictures up, but here they are! First Keith sent me a new scale! It's perfect because i now have a backup for my original one! One for home and one for out in the field! Second, Keith sent me a probe that he made himself! It is what i'm guessing to be made of brass! It is a very cool piece! He explained to me, i can use it to test the dirt, and use it to find certain things in the ground without having to pinpoint them every time! I can't wait to try it out! Thank you very much for the great gifts Keith! And thank you Carol and Vlad for this great gift exchange! I look forward to doing it again next year! Beefcake (Brian) should have received his yesterday! Nice move Dennis. No one should be left out. Nice gifts. Keep the photos coming. Thanks Keith...that's what I thought too. Happy Holidays! not sure what happened? I posted I wanted in this and my name is not on the list....I guess I am not allowed to play in this game? I don't see your post on the Gift Exchange thread? I had fun and will be back next year for sure! Thanks Carol and Vlad! Last edited by itsaring! ; 01-01-2013 at 04:54 AM. Looks like he posted on the thread in forum announcements asking if there was a gift exchange this year... along with quite a few others! Sorry! I guess they needed to follow up on that thread. A whole bunch of coin sleeves. Something i need desperatly and cant find easily here. I actually used the last of mine on his gift. Sterling silver bracelet. Love old silver jewelry. A bunch of very old foreign coins which i will dig into re searching. a couple VOC coins which i just became familar with a month a go and love to collect. A state of washington tax token. Those are always cool. Thanks swing, i greatly appreciate the gift. Everyone have a safe and happy new year! Vlad and Carol thanks again for doing this exchange and for your dedication to this web site and our hobby. It is greatly appreciated. Last edited by RingNut; 12-31-2012 at 04:43 PM. Today I received the second half of my gift from Air Force Mike. It's a great 101st Airborne hat. The unit I was with in Vietnam. He also sent a beautiful 101st Airborne Challenge Coin. I still have the one they gave me when I left the unit. They have changed some in the past 43 years. Nice gift AFMIKE ad Silversmith45! I always like seeing the 101st Airborne coins. Spent most of my childhood around the base. Here is a pic of my present from Azmodeus. Lots of goodies in here. Several coin books, a couple of silver dimes several foriegn coins and some coin holders. A two dollar bill and a confederate bill. Thanks again Azmodeus. Man i love that hat...looks great Richard and once again TY for your service to our country and giving me the ability to enjoy my freedom and time to MD!! I received my package today from YoungPatriot, it included lots of nice stuff. A book from Charles L. Garrett, that I have'nt been able to set down. Magnifying glass, safety vest, and a couple sweet finds bags. Got my gift from Clearwatermike today! Haven't had time to take pictures but I have a nice collection of detecting magazines that would be fit for any THers library! Thanks Mike!!! No pics, but I must say that this was the 1st year I participated in this event and really enjoyed it. Got a real variety value pack from quaidmon. Already looking forward to next year and collecting things over the year to give. Thanks for putting the effort into this holiday event. I got my gift from Tin-Tin and couldn't be happier! Thank you TT and Thanks to Vlad and Carol for a great X-Mas idea and hands down the best MD Forum on the web!!! Sorry that you can't read the Mothers Medallion I did the post on my phone and didn't pick the best pic. My oldest daughter claimed the medallion as she's a single Mom and my youngest daughter claimed the Dragon Fly Key chain. I already used one of the hand warmers on a hunt yesterday, 27 degrees and it was great. I didn't find much but my hands were warm!! Thanks Again Tin-Tin!! Got my gift from NCbounty15. Thanks for the cool stuff! Your's is on its way! Thanks buddy!